I generally avoid political discussions on Facebook – instead I prefer to use this blog and Twitter to talk politics. It’s shocking and dismaying how many millennials have been fooled by the Soviet-style propaganda of the warmist left. How do they not see that the science has become corrupted and politicized? Real science is not proven by “consensus.” Real science doesn’t lie and manipulate data. Real science welcomes debate. It doesn’t try to silence the (growing numbers of) detractors. And with real science – predictions occasionally come true. Do kids today not have working BS meters? What ever happened to questioning authority? Do they not realize that all of the “rebels” on this issue are on the skeptical side? The kids today are on the side of fossilized left-wing Malthusian geezers who have been flogging this pathetic, false narrative for decades. The people behind this movement are the opposite of cool. I’d recommend that they “trust but verify”, but after ClimateGate I and II and III, the major players responsible for the climate hoax have proven themselves unworthy of their trust. This should be a no-brainer. Verify yes… Trust? Oh hell no. If not for the warmists in the Obama administration – who keep pushing this agenda with near religious fervor – the global warming/climate change hoax would have gone the way of the global cooling hoax of the 70s, by now. The same politicized “scientists” from ClimateGate I and II and III continue to manipulate climate data hoping no one will notice, but not caring too much if a few do, because they know that the MSM will have their backs. The powers behind this hoax have dug in deep, and because the left-wing media is ideologically predisposed to embrace a left-wing narrative, it’s di fficult for the truth to break through – even though most climate scientists now dispute the notion of catastrophic man-made global warming – because the actual facts don’t bear it out. This isn’t a “conspiracy theory.” It’s right out in the open for anyone with eyes to see. Anthropogenic “climate change” is, and always was, a radical campaign to reduce the world’s population. A misanthropic agenda engineered by the environmental movement in the mid 1970’s, who realised that doing something about “global warming” would play to quite a number of its social agendas. Maurice Strong found willing accomplices in politicians like Al Gore and Tim Wirth. In a speech in 1993, Wirth didn’t even try to hide the naked political objective. “Never let a crisis go to waste” of course being a major tenet of the left – even when they have to make up the crisis to move their agenda forward. “We need to get some broad based support, to capture the public’s imagination… So we have to offer up scary scenarios, make simplified, dramatic statements and make little mention of any doubts… Each of us has to decide what the right balance is between being effective and being honest.” — Prof. Stephen Schneider, Stanford Professor of Biology and Global Change. Professor Schneider was among the earliest and most vocal proponents of man-made global warming and a lead author of many IPCC reports. He is a member of the Club of Rome. “The concept of national sovereignty has been an immutable, indeed sacred, principle of international relations. It is a principle which will yield only slowly and reluctantly to the new imperatives of global environmental cooperation. It is simply not feasible for sovereignty to be exercised unilaterally by individual nation states, however powerful. The global community must be assured of environmental security.” — Maurice Strong, Executive Director of the United Nations Environment Programme (UNEP), Al Gore’s mentor and executive member of the Club of Rome. “I believe it is appropriate to have an ‘over-representation’ of the facts on how dangerous it is, as a predicate for opening up the audience.” — Al Gore, member of the Club of Rome and set to become the world’s first carbon billionaire. He is also the largest shareholder of Chicago Climate Exchange (CCX), which looks set to become the world’s central carbon trading body. Essentially Obama helped fund the profiteers of the carbon taxation program that he then steered through Congress. “We are grateful to The Washington Post, The New York Times, Time Magazine and other great publications whose directors have attended our meetings and respected their promises of discretion for almost forty years. It would have been impossible for us to develop our plan for the world if we had been subject to the bright lights of publicity during those years. But, the world is now much more sophisticated and prepared to march towards a world government. The supranational sovereignty of an intellectual elite and world bankers is surely preferable to the national auto-determination practiced in past centuries.” –David Rockefeller, in an address to a meeting of The Trilateral Commission, in June, 1991. Dr Tim Ball, Watt’s Up With That? : Pope Francis Apparently Doesn’t Know IPCC Climate Objective Contradicts Catholic Doctrine. Pope Francis advocates the global warming agenda of the UN Intergovernmental Panel on Climate Change (IPCC), with the help of the Obama White House. Apparently, he doesn’t know their ultimate objective of reducing and controlling population generally contradicts Catholic doctrine. The irony is that as a Jesuit, the ideological church police, he should know, but apparently, his personal, political and economic perspective trumps it. 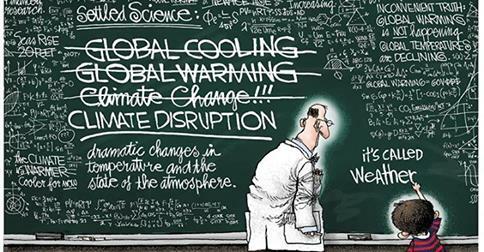 This entry was posted in Climategate. Bookmark the permalink. ← Forum: Who Will Be The 2016 Nominees? Whom Would You Like To See? Pingback: Watcher’s Council Nominations – ‘Whose A Terrorist?’ Edition | Virginia Right!